In a research laboratory in Japan, the country's public broadcaster is working on a successor to the familiar high-definition broadcast system. NHK doesn't expect its Super Hi-Vision video format to make it to actual broadcast until 2025. But with screens getting ever bigger and people demanding better quality pictures, it does believe it can have a future. That future might not be the living room though. Masuru Kanazawa, a research engineer at NHK's Science and Technical Research Laboratory, told delegates at the BBC's Festival of Technology that the format might not be suitable for the average viewer. "It requires a screen size of at least 60 inches which means there are limits on the usage of the system. It will depend on the viewing situation," he told delegates at the two-day conference. Watching fast-moving images at close quarters could "make people feel sick," he said. The average size of a TV in the home has increased from the 12 inches seen in the 1950s. 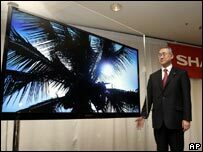 The recent CES show in Las Vegas saw the debut of screens topping 150 inches. 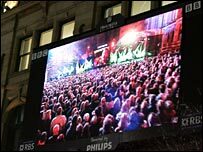 NHK is working with the manufacturers who are developing such enormous screens but it does see other uses for its technology. Big screen broadcasts of concerts and sporting events or galleries wanting to show off works of art were among uses suggested by Dr Kanazawa. Super Hi-Vision - or Ultra High-Definition TV as it is sometimes known - carries some impressive statistics. It has a screen resolution of 7680x4320 pixels, 16 times greater than current HD. To watch the format NHK has a purpose-built 500 inch screen in its labs, along with the world's only 22.2 multi-channel surround sound system, which the format also supports. Currently there are only two cameras capable of recording the format. They are extremely bulky and heavy and are capable of shooting less than 20 minutes of film each day. To transfer just 18 minutes of video requires some 3.5 terabits of data. So far the technology has been put through its paces in a theatre in Japan. Over a six-month period some 1.5 million visitors were shown what the format could do, viewing shots of themselves as they entered the building on a 600 inch screen. The technology also drew the crowds, including members of the Hollywood hierachy, at the annual NAB (National Association of Broadcasters) show in Las Vegas. The Japanese government is interested enough in the research NHK is undertaking to provide 300m yen (£1.46m) for further research. It hopes to make it a broadcast standard by 2015.